“When I arrived in Congress, Jim Jordan was one of the first colleagues I got to know—and in the time since, I can honestly say Jim is one of the most honorable, thoughtful, and principled men I’ve met in Washington. Jim is a fighter, a leader, and a true conservative in every way,” Meadows said in a statement on Thursday. Meadows, as the leader of the conservative Freedom Caucus, serves as an important leader of conservatives in the House of Representatives. Congressman Meadows argued that if Americans vote to keep Republicans in control of Congress’s lower chamber, then Jordan will fight for “real changes” in Congress. Christina Hagan, a pro-Trump conservative running for the House in Ohio, tweeted in support of Jordan’s speakership bid on Thursday. Congressman Jordan announced his candidacy to replace the outgoing Speaker Paul Ryan on Thursday morning. Jordan will likely compete against House Majority Leader Kevin McCarthy (R-CA) and House Majority Whip Steve Scalise (R-LA) to lead House Republicans in the next term should they retain their majority. “President Trump has taken bold action on behalf of the American people. Congress has not held up its end of the deal, but we can change that. It’s time to do what we said,” Jordan said in a statement on Thursday. 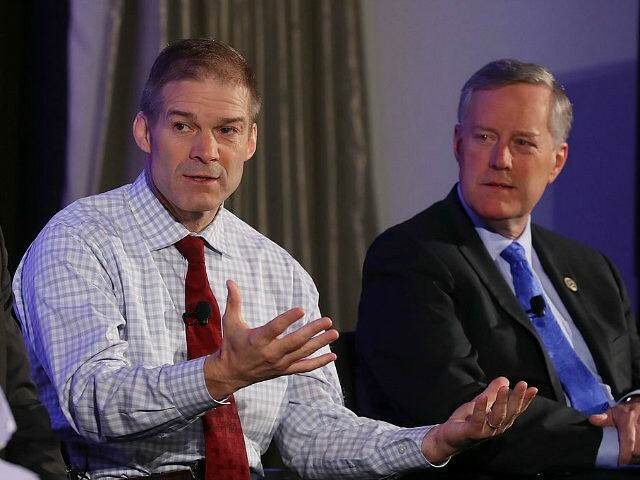 Congressman Jordan wrote a letter to fellow House Republicans that, if they elect him to become the next Speaker, Republicans can fully repeal Obamacare, reform welfare, build a wall on America’s southern border, make the individual tax cuts permanent, end funding for abortion-provider Planned Parenthood, and truly cut spending.